This type of system uses individual pressure sensors mounted inside each wheel. Each sensor sends its signal to the vehicle via a live, wireless connection. In Europe, the transmission frequency of direct sensors is 433MHz. Fast reacting to changes in tyre pressure – typically only taking a few seconds. Highly accurate – measuring to 1 or 2 psi. Will detect a puncture, even after parking. Will detect a slow leak. Able to identify specific locations of pressure issues. Requires maintenance/servicing, using specialist tools and equipment. Risk of damage to sensors when tyres are removed. This type of system does not directly measure the pressure in the tire, but uses the ABS sensors on the vehicle to assess the rotational speeds of each wheel. An under-inflated tire will have a slightly different diameter than a fully-inflated tire, resulting in that particular wheel having a different rotational speed. This information is then sent to the vehicle’s on-board computer, which triggers the TPMS warning light. Technology already installed on vehicles. Doesn’t require servicing or the need for special tools. No risk of damage when removing tires. Generally not as accurate as direct sensors. 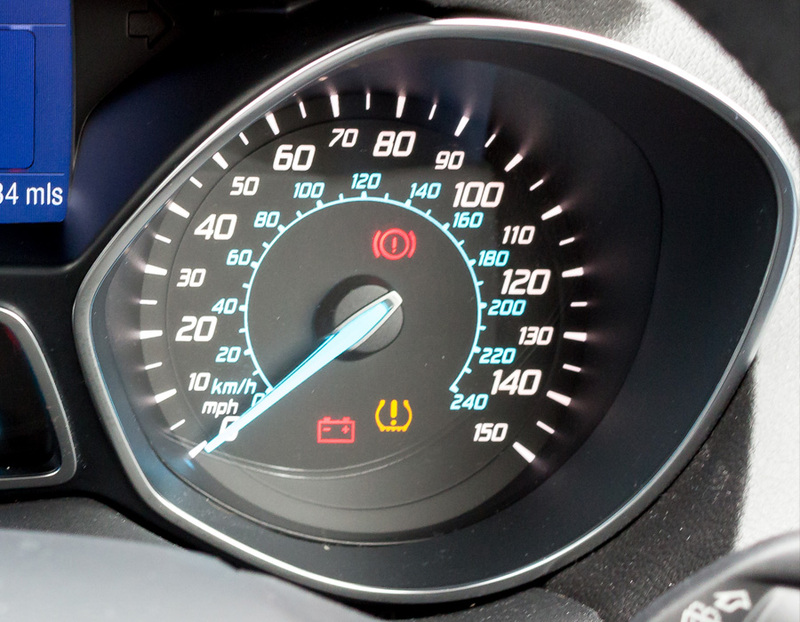 Slow to react – vehicles often need to be driven for a considerable amount of time before the TPMS warning light comes on. A puncture after parking may not be immediately identified. Since tires lose pressure naturally, roughly at an equal rate - this can result in all four tires being under-inflated, without the warning light coming on at all. Some indirect systems do not work well with non-OE replacement tires, requiring specific tires to be installed for the system to work properly. Requires recalibration by the driver every time a vehicle’s tire pressure is adjusted or a tire is changed. Programmable – These are aftermarket sensors that arrive blank and need to be uploaded with vehicle protocol software, via a sensor programming tool, prior to vehicle installation and use. Configurable – Typically aftermarket sensors that prior to use require protocol selection from a series of available protocols, which are programmed onto the sensor. A specific LF (low frequency) command from a TPMS diagnostic tool is required for this operation. One-to-One Replacement – Direct, pre-programmed replacements for OE sensors made by the vehicle’s manufacturer. Multi-Protocol – Aftermarket sensors that are pre-programmed with a variety of vehicle protocols/software. Customers with summer and winter tires will come in at least twice a year and can benefit from cloned TPMS. Improved relationships with customers via regular contact and possibility to add additional services. TPMS increases the importance of the tire bay or workshop for servicing purposes, to ensure that the correct torques and fitting are applied to TPMS stems and sensors. All manufacturers recommend that TPMS sensors should be checked regularly and serviced every time a tire is changed or the sensor is removed. As a general rule, sensors should last for approximately 5-7 years before the battery will need to be replaced. However, sensors can become faulty or fail completely as a result of weather damage, corrosion or accidental damage caused when changing tires. To ensure the sensor remains in good condition, most manufacturers recommend servicing them (i.e. replacing the valve cap and core components) every time a tire is changed. When replacement sensors are fitted to your vehicle, your tire fitter may need to program the new sensor to the car using specialist diagnostic equipment. If your TPMS sensor does develop a fault, under no circumstances should this be removed and replaced with a ‘standard’ non-TPMS type valve. What does a Tire Pressure Monitoring System do? Tire Pressure Monitoring Systems (‘TPMS’) are used to check and monitor the air pressure inside a vehicle’s tires. They are designed to enhance vehicle safety and efficiency, using a system that alerts the driver when tire pressure falls below the minimum value for the vehicle by displaying an alert on the dashboard. These systems can be either Direct or Indirect, depending on the vehicle. Why do we have TPMS? The TREAD Act mandated the use of a suitable TPMS technology in all light motor vehicles (under 10,000 pounds), to help alert drivers of under-inflation events. This act affects all light motor vehicles sold after September 1, 2007. Phase-in started in October 2005 at 20%, and reached 100% for models produced after September 2007. In the United States, as of 2008 and in the European Union, as of November 1, 2012, all new passenger car models (M1) released must be equipped with TPMS. For N1 vehicles, TPMS is not mandatory, but if it is fitted, it must comply with the regulations. It is thought that only 4% of people drive with all four tires properly inflated - however figures show that under-inflated tires are a contributory factor in 9% of all fatal road accidents and 41% per cent of road accidents resulting in serious injuries. It is also estimated that worldwide, 20 million liters of fuel are burnt unnecessarily each year due to low tire pressure, releasing two million tonnes of CO2 into the atmosphere annually. If the “low tire pressure” warning light appears on your dashboard when the ignition is turned on, your vehicle will have TPMS installed. 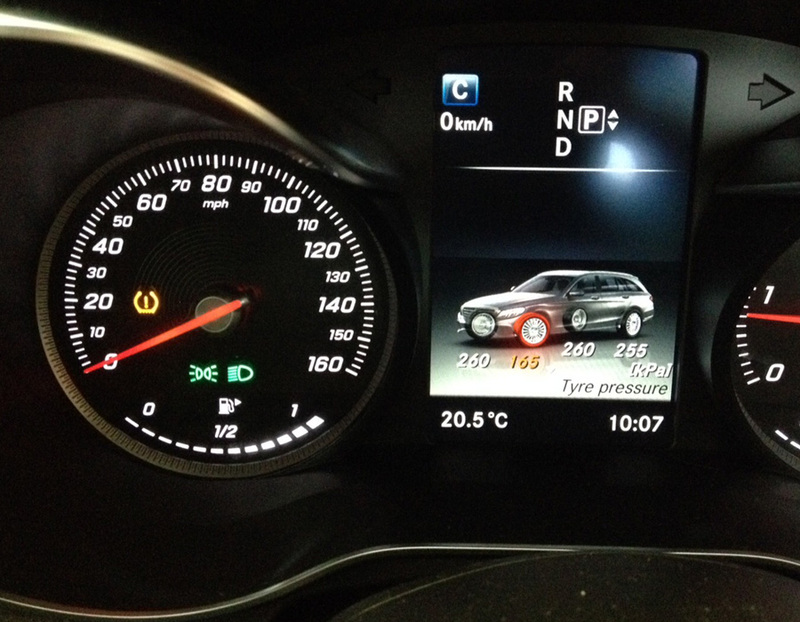 What does the TPMS warning light look like? What is the difference between OE and Aftermarket Sensors? OE Sensors are ‘Original Equipment’ sensors, from the same manufacturer that built the sensors for the vehicle when it was assembled. These sensors are supplied pre-programmed, with a single vehicle protocol from the factory. Aftermarket Sensors are replacements for the vehicle’s Original Equipment sensors. This includes OE replacement (OE-R) sensors, cloneable sensors, configurable sensors, multi-application sensors and programmable sensors. Which type of sensor do I need for my car? Please use our Vehicle Look-Up Tool to check for your car's compatible sensors. How often do sensor valves require servicing? All manufacturers recommend that when a tire fitted with TPMS is removed, the sensor valve is serviced or replaced. This is because the valves are subjected to chemicals and road salt during the Winter, and are affected by metal fatigue over time. Can I replace the valve on my sensor? 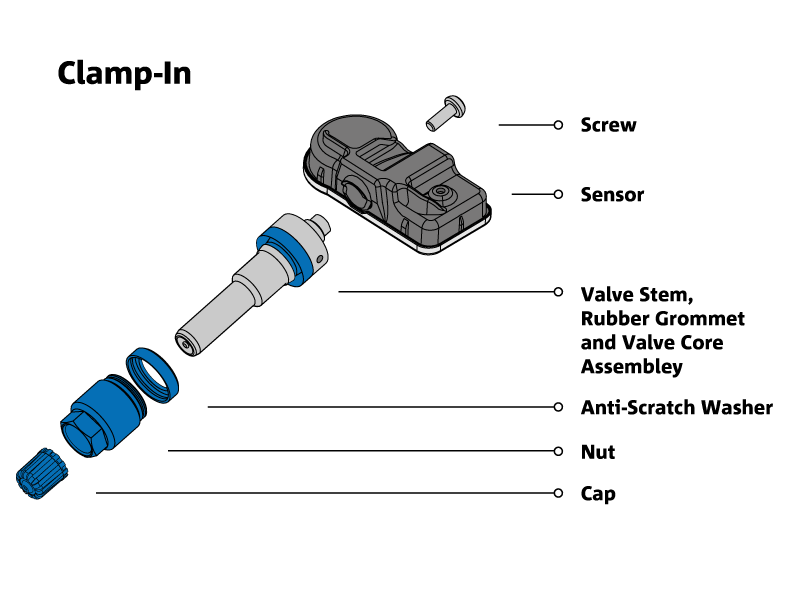 Please use our Vehicle Look-Up Tool to check if your current sensor has serviceable parts. When fitting sensors, do I need any specialist workshop tools? A calibrated Torque tool is required as TPMS valves are made of a softer metal (aluminum), which is susceptible to damage if the correct tool is not used. The TPMS warning light has appeared on my dashboard. What could this mean? You have low pressure in one or more tires. You have a puncture in one or more tires. One or more of the sensors fitted have become damaged or the battery has expired. There may be a TPMS malfunction. I have checked my tire pressures, but my TPMS light is not switching off. What could this mean? This could mean a sensor is damaged or the battery has expired. It could also be the result of an extreme weather change – occasionally if the weather is very cold, this can cause a drop in tire pressure (while heat can cause a slight increase in pressure). Every morning my TPMS light comes on, but after driving for a short time, it switches off. What could this mean? Normally this means that one or more of your tire pressures are very close to the low-pressure threshold. Overnight when your tires are cold, the pressure will be at its lowest, which may bring the pressure either close to or below the 20% minimum pressure allowance - switching the TPMS warning light on. Once you start driving however, your tires will warm up and the pressure will subsequently increase; turning the warning light off. Check your tire pressures before you drive to make sure they are at the correct pressure. What is the difference between Direct and Indirect TPMS? Direct TPMS sensors are physically mounted onto the wheel rim and measure each tire’s individual air pressure. When this falls below the manufacturer’s recommended level, the sensor transmits this information to the car’s on-board system and triggers the TPMS warning light on the dashboard. Indirect TPMS is an integrated system that uses the vehicle’s Antilock Braking System (ABS) to monitor and compare the rotation speed of the wheels. If a tire’s pressure is low, it will rotate at a different rate to the other tires - this is then detected by the vehicle’s computer system, which activates the TPMS warning light on the dashboard. Indirect systems are widely viewed as being less accurate and less reliable than Direct TPMS. What are the primary benefits of TPMS? On average, how long do TPMS sensor batteries last? The batteries in TPMS sensors are moulded within the sensor housing and are intended for a one-use application. The batteries typically have a lifespan in of 5-7 years depending on individual driving patterns, and provided they are not exposed to corrosive environments or severe misuse. Why is more than one OE sensor listed for some vehicles? Sometimes TPMS sensors are updated physically by the manufacturer without changing the protocols electronically. This happens often with VDO, changing from TG1B to TG1C sensors - or even sometimes having a TG1C sensor as standard, but using a TG1D when some alloy wheel options are chosen. Why can’t my TPMS diagnostic tool trigger, activate or reset some sensors? If your TPMS diagnostic tool cannot activate or reset a sensor, we recommend updating your tool to include the latest TPMS sensors. With a rapidly growing TPMS market, new sensors are released on a regular basis. Upgradeable TPMS tools, such as the H46, are always compatible with the latest TPMS sensors released onto the market. What should the torque value be set at? Every manufacturer has a designated torque specification for the components of the metal valve service kits. Follow the specification that is specific to the service kits being sourced - most service kits provide these specifications on the individual bags the kits are packaged in. A full set of adjustable service tools should be used on the various components, including the base nut and the valve core. Why is it important to service a sensor when it is removed from the wheel rim? The components that provide a seal have a “memory” of where it was placed and the amount of clamping force. When the old seal is taken off the rim, it is deformed and will not properly reseal when retightened. The installation of a new service kit will provide the sealing components for each applicable sensor (Clamp-In or Snap-In). What are the differences between Snap-In and Clamp-In sensors? Different methods are needed for sensor installation/dismounting. A Clamp-In sensor mounts via the wheel’s valve hole and is secured with a mounting nut, then sealed with a separate grommet. Snap-In sensors feature a traditionally mounted rubber valve style. Which parts of the sensor require replacement when servicing? 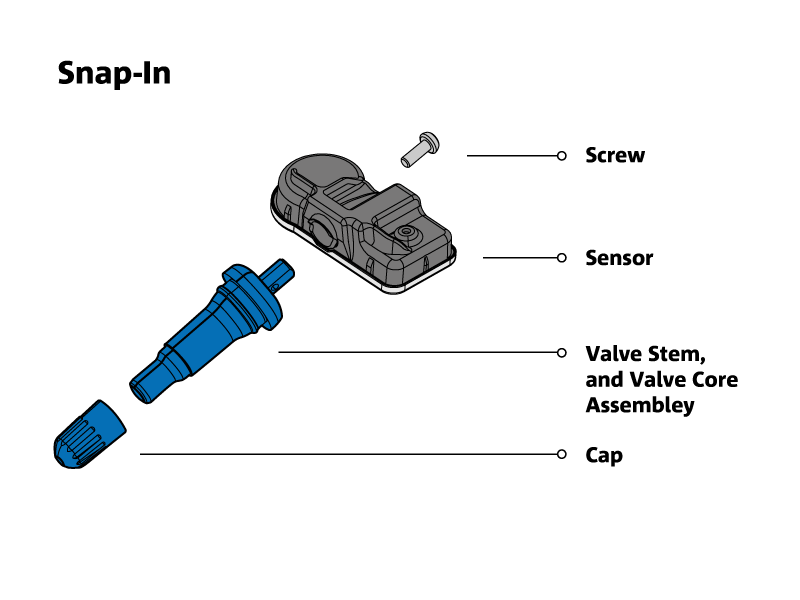 Components that require replacement when servicing sensors are highlighted in blue.